From the public to politicians and a host of big names in music, TV, entertainment and sport, thousands of people got behind Samaritans’ 24-hour event this week, to spread the word that listening can be the first step to saving a life. Across the UK and Ireland, Samaritans volunteers were out in force sporting eye-catching Big Listen ears on high streets and in train stations, talking top tips on listening with passers-by. Samaritans also released a video called ‘Every Hour, Every Day’ revealing 24 hours in the lives of five of its volunteers, and how Samaritans are there to listen anytime and no matter what. 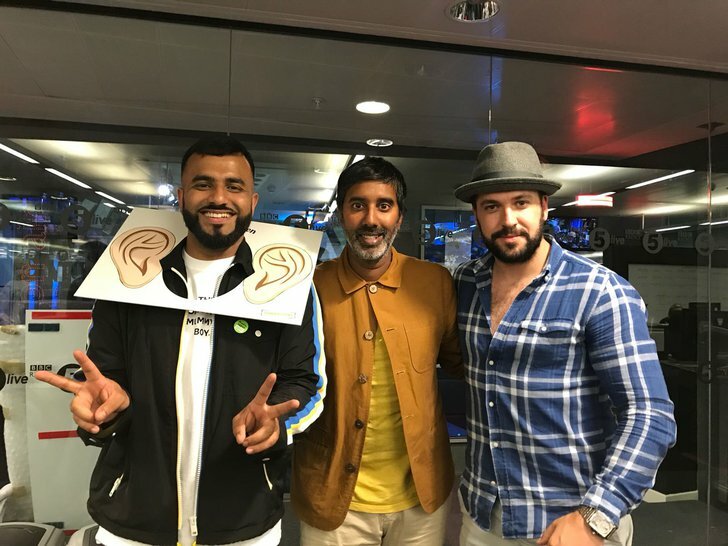 Poet and campaigner Hussain Manawer helped get the conversation started about the power of listening on BBC Breakfast while singer and presenter Michelle Heaton shared her experiences of listening and being listened to when things get tough, with Christine Lampard on ITV’s Lorraine show. ‘Leave the Light On’ sensation Tom Walker treated travellers to a surprise performance of his phenomenal hit at London’s Waterloo station. He chatted to fans, Samaritans volunteers and the public before giving a beautiful rendition of the song he wrote about being there to listen to a friend in need of support. Tom then promptly signed and donated the guitar he had just played to raise vital funds to help keep Samaritans’ emotional support services free for anyone who needs them 24/7, 365 days a year. Others who donated items included Sir Paul McCartney, David Walliams and Joanna Lumley. 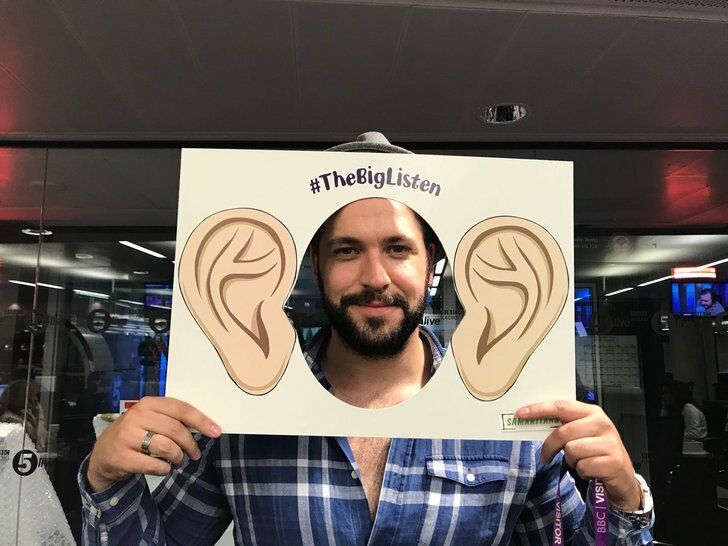 Tom and Hussain later met up across the airwaves to promote The Big Listen on BBC 5Live’s Afternoon Edition, presented by Nihal Arthanayake, where they were joined by former Coronation Street star and Big Listen supporter, the actor Shayne Ward. Together they explored the question, ‘What can I do if I’m worried about my friend’s mental health?’. Hussain performed a specially written poem for the show, called Indirect Emotion, about learning how to listen to and support a friend who’s struggling. The studio’s phone and text lines lit up with men especially joining the discussion, opening up about issues from depression to bereavement. Samaritans Ambassador Audley Harrison MBE, Ruby Wax, Theo Paphitis, Olympian Liam Pritchard and performance poet Tim Key were among celebrities creating a Big Listen buzz online, alongside author Unmummsy Mum, comedy duo Scrummy Mummies, mental health blogger Sophie Edwards and footballer Ruth Fox, who will also be taking part in Ride London for Samaritans this weekend. Others who donated fundraising prizes for The Big listen included Gloucester Rugby Club, Hachette UK, The Grove, Virgin Trains, Greater Anglia Trains, First Direct Arena and Leeds Building Society. Iconic landmarks including the Blackpool Tower, Gloucester Cathedral and the Royal Shakespeare Company’s Theatre Tower in Stratford-upon-Avon lit up green to show support. The Big Listen even featured in Parliament, thanks to a Health Question on suicide prevention from MP Liz Twist, whose husband took his own life. Donations made throughout the event will help Samaritans keep its emotional support services free for anyone who needs them, 24/7, as well as helping to recruit, train and support its volunteers, who answer calls and run hundreds of branches of Samaritans across the UK. 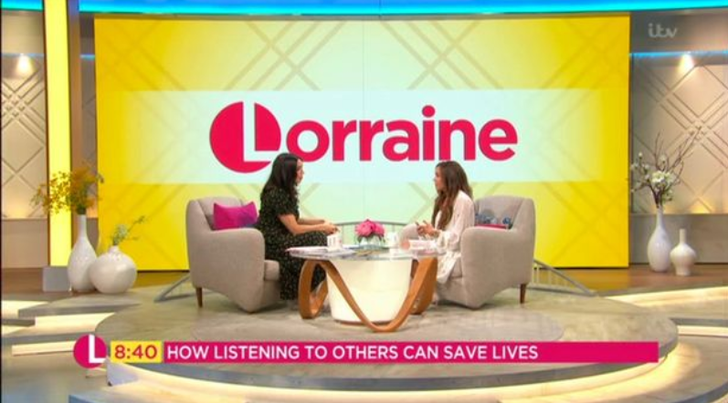 “We are grateful to everyone who has supported The Big Listen and helped raise the profile of listening as a life-saving skill. We are also overwhelmed by the generosity of the public, our celebrity supporters and corporate donors, who have given their time and support to help us raise vital funds. You can find out more about how to be a good listener here, or make a donation to Samaritans here. For more information, please contact [email protected] or 020 8394 8300. Samaritans responds to more than 5 million calls for help a year.